Enhancing data quality processes can provide an agency with more accurate, complete, consistent, and timely data. Improving data quality improves the credibility and value of data analyses and in turn decision making based on these data. The following section outlines steps agencies can follow to implement a sustainable data quality management program. Source: Minnesota Department of Transportation, Data Business Plan. Data quality is assessed with respect to a particular set of business needs. Data considered adequate for reporting on system-wide performance may not be sufficient for impact assessment. While agencies generally seek to collect data once and use it multiple times for different purposes, it should be recognized that this means the data must meet quality requirements of the most demanding business use. Analyzing the cost to achieve the various quality standards and the associated business value is critical. Once the business purpose(s) for data have been identified, quality requirements can be defined. The table below includes a set of data quality characteristics that can be used to consider requirements and develop quality metrics. Data accuracy refers to the match between the data and real-world conditions. Assessing data accuracy frequently requires defining a set of validation rules for a data set, as well as measuring the number of errors (records not meeting the rules) and establishing a maximum acceptable error rate. However, this accuracy assessment method can miss many errors, i.e., data may be in acceptable ranges but still not be correct. Therefore, independent verification processes are needed to gain a true measure of accuracy. These may involve an independent re-collection of data for a sample of records, or cross checks against an independent source (if available). An accuracy metric can be established based on the percent of independently verified records that match the original record. Data completeness refers to the extent to which a data set provides the intended (or required) degree of coverage and whether it includes values for attributes that are considered essential for a particular business purpose. For some types of data, the assessment of coverage is straightforward. For example, one can determine the percentage of National Highway System (NHS) mileage covered by a pavement data set. For other types of data, the assessment of coverage can be more challenging. For example, it is not easy to tell whether a crash data set contains all crashes that occurred that meet established reporting criteria. Data consistency refers both to consistency of records within a data set and across data sets that have been independently collected. Internal inconsistencies may result from lack of standard data collection processes. For example, there may be inconsistencies across bridge inspection records within a data set due to insufficient inspector training, leading to varying interpretations of attributes. Inconsistencies across data sets may be due to use of different methods or data definitions. In another example, pavement condition data for the state highway network may have been collected using automated crack detection methods, whereas a local pavement condition data set may have been based on visual crack observations. This inconsistency could make it difficult to create a consolidated report on pavement condition on the NHS. Another common issue related to data consistency is changes to attribute definitions or measurement methods over time. Lack of consistency in attributes, attribute definitions, and collection methods can pose barriers to use of data for baseline development, trend analysis and benchmarking. Consistency can be assessed and improved by developing and documenting clear data standards, covering definitions, measurement methods, formats, and valid value ranges. Data timeliness refers to the amount of time that it takes from collection of the data to making the data available for use. Timeliness can be improved through automation, ensuring sufficient staff resources to perform collection and processing tasks, and streamlining of review and approval processes (within and across agencies). There may be practical constraints on resources for data collection, quality assurance and processing activities that limit timeliness improvement. Data currency is a related concept that represents the extent to which a data set represents current conditions. For example, a requirement for data currency might be that all bridge condition records reflect inspections completed within the last two years. Defining data quality requirements and metrics involves tradeoffs. For example, an agency may decide to release data that is 80% accurate – based on a realization that getting data to near 100% accuracy would require so much time and effort that the data would no longer be valuable by the time it was released. High quality data requires investments in the data itself, and in processes to measure, track and address data quality. An independent verification process can be essential to ensure data accuracy, but requires additional effort beyond the primary data collection. Some agencies choose to view the cost of quality assurance as an integral part of the base data collection cost. 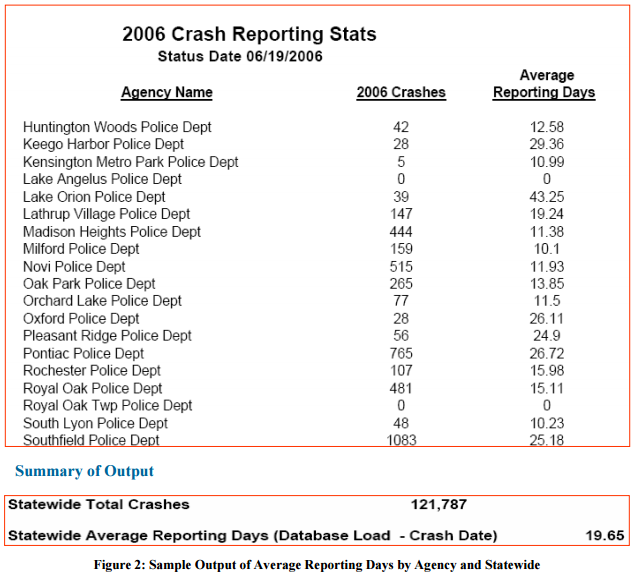 FHWA developed the Crash Data Improvement Program (CDIP) Guide to “assist state crash database managers and other traffic safety professionals in identifying, defining and measuring the characteristics of the data quality within the state crash database.” The CDIP Guide focuses on crash data timeliness, accuracy, completeness, consistency, integration, and accessibility. For each of these elements of data quality, the Guide provides ways to develop a metric and assess performance, and provides examples of metrics. Data validation rules can be established to assess accuracy, consistency, and completeness. Data validation rules are best established through a collaborative effort between subject matter experts with an understanding of the data and data uses, and data managers who understand how to translate the rules into precise language required for automation. Data quality checks are best implemented as part of a data collection or data entry process so that problems can be detected and corrected early on. Where this is not practical, validation rules can be applied to existing data sets. This can be accomplished as a series of queries, or implemented via data profiling and cleansing software. Manual review of data can be helpful to elicit ideas and suggestions for validation. An iterative approach can be taken involving implementation of basic validation rules and then manual review to refine the existing rules and identify additional rules. Virginia DOT (VDOT) uses over 95 rules to validate data as part of its Traffic Monitoring System Raw Data Error Review Process. Automatic review software uses these rules and data comparisons, and assigns quality ratings to the data along with advisory messages. These ratings and messages can then be reviewed manually, and updated where appropriate. The table below describes the icons used to depict four levels of message urgency for quick recognition. VDOT started using the software around 1998-1999, and has refined the process over time. The agency adds new tests to the review process when staff analyzes the data or troubleshoots hardware and equipment issues. The agency has found value in new calculated data comparison. VDOT has also developed an automated review process to review specific data instead of the full data to avoid meaningless review results. Several years ago VDOT color-coded the date selection calendar in order to provide users and managers with a quick indication of data existence, review status, and the health of the data collection. 1 A question mark in a green circle. An advisory of a questionable nature. 2 A lowercase letter I in a blue circle. An informational advisory. 3 An exclamation mark in a yellow triangle. A warning level message. 4 An X in a red circle. An error level message. Data quality management is an ongoing process for ensuring that data meet established quality requirements. Continually improving data quality can increase data value, leading to improved decision-making at an agency. Developing quality management processes can help ensure that data quality remains an ongoing priority after initial data acquisition efforts. Modification of data entry applications to build in lists of values and data validation rules. FHWA developed the “Practical Guide for Quality Management of Pavement Condition Data Collection” in 2013. 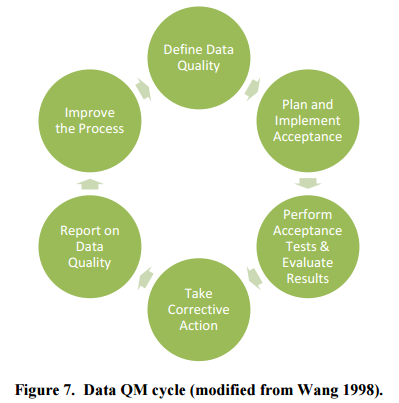 The report includes a quality management cycle for pavement data. The cycle involves six steps and includes feedback, with continual data evaluation and process evaluation. To provide value for decision making, data must be available in useful forms to different audiences. Potential users need to know what data exist and how to obtain them, and understand their derivation and limitations. Ideally, information about available data and points of access for data will be consolidated within an agency to make it easier for staff to discover and use data. Ensuring accessibility to external data sources and, conversely, providing external access to agency data (where feasible and appropriate), can facilitate collaboration in performance-based planning and programming by providing a common view of historical, current and (where available) forecasted performance conditions. The following section outlines steps agencies can follow to ensure good access to data in support of transportation performance management. Once a set of representative performance data use scenarios are assembled, a broader picture of data access requirements will emerge. What data need to be accessible to external partners and what data are primarily of interest to internal agency users? Which types of users need to see data primarily in summary form? Which types of users need to have access to full data sets for detailed exploration? Are there standard views or reports that would address the primary needs of particular audiences? Which types of users have specialized analysis needs that require integration of performance data into analytical tools? It is also important to consider how to ensure that data are sufficiently documented so that users will understand their limitations. Different audiences will require different levels and types of documentation. For example, a data analyst may want highly detailed information about a data set’s derivation, whereas a senior manager would prefer to see a few clearly marked essential highlights that facilitate their interpretation and use of the data. Once requirements are established for data access, the agency can assess its existing data access and reporting tools, identify gaps, and plan improvements. Some improvements can be implemented within specific business units; others are more appropriate to pursue at the agency-wide level. For example, a safety analysis unit may implement specialized tools for data access and analysis, whereas an effort to build or enhance a data warehouse and business intelligence environment would typically be an agency-wide initiative. An agency-wide approach—if well planned and designed—can cost-effectively address multiple business needs with a single set of solutions. Making Data Findable – Data need not all be stored or accessed from the same place, but information about the data can be centralized to make it easy for people to find. Consider implementing a central data catalog to provide a single place to find what data sets are available and how to access them. Maintaining Data in Authoritative Sources – New data repositories may be created to support reporting – with integrated or transformed data. It is good practice to make sure that these repositories are used for reporting only – rather than as a secondary location for data updating. When data errors are discovered it may be easier to correct these errors directly in the repository that is used for reporting, but this creates extra work in the long term. Errors should be corrected in source systems. Document and Automate Data Loading – A repeatable and disciplined approach to data transformation and loading from authoritative source data systems to reporting repositories should be followed. Extract-Transform-Load (ETL) tools are available for defining and automating data transformation rules. Managing Data Access – Clear access policies should be established to protect sensitive data and to explicitly identify what data should be made available outside of the agency. There is a balance between maintaining confidentiality and enriching availability – policies to address this are necessary, as is oversight and an understanding of who has authority to grant access. Managing Metadata – Data users will want to understand the source(s) and derivation of data sets and the meaning of different data elements. It is important to have a strategy for creating, updating and delivering metadata at both the data set and data element level. As noted above, different types of audiences will want to see metadata at different levels of detail. Washington State DOT developed the Data or Term Search (DOTS) application to create a common data vocabulary across the agency. DOTS describe the database schema, data definitions, and the business stewards – it answers the “What? Where? Who?” questions about the data by describing what data are available, where data are available, and who to go to with questions. Minnesota DOT implemented a data catalog developed by data stewards designated to specific business domains throughout the DOT. The data stewards identified and documented data items within their domains. The documentation included data terms and metadata (approved term name, term definition, source of record, data classification, and responsible data steward). This information was included in the Business Data Catalog, which staff can use. Cited benefits of the Business Data Catalog include helping to prevent data redundancy and to identify opportunities for reuse. Utah DOT has a three-prong approach to making data findable for agency employees and the public. First, the UDOT Data Portal provides access to news, training, applications, and both spatial and non-spatial UDOT data. Second, UDOT Open Data provides a clearinghouse for UDOT’s public data, where users can browse by category (e.g., assets, maintenance, planning, projects, etc. ).Third, UPlan serves as UDOT’s map center, where users can search existing maps or create their own. 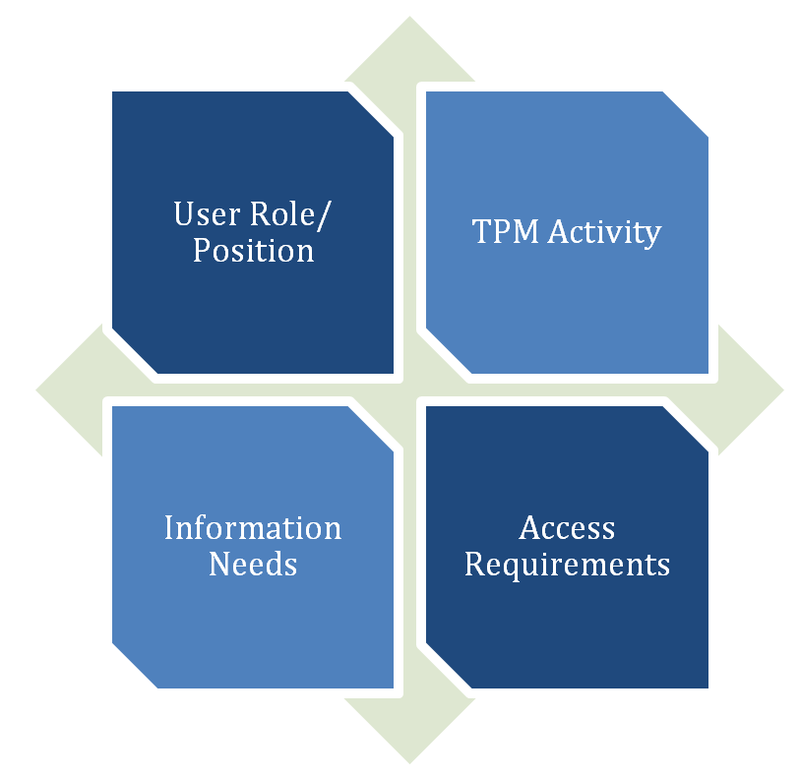 TPM activities typically require use of multiple data sets from different sources. For example, in order to understand the relationship between incidents and congestion patterns, the analyst might use data from an incident reporting system together with travel time or speed data. To facilitate analysis, the two data sources should use compatible location references and units of time. Data standardization is also critical for presenting an integrated view of performance across jurisdictions and modes. Collaboration efforts across agencies on performance monitoring and reporting will need to include early discussion of standards for performance measures (see External Collaboration, Component B). Advance planning is important to ensure data standardization; once data are acquired, it may be difficult or impossible to transform it into a standard form. This subcomponent discusses ways to strengthen organizational capabilities for data standardization and integration. A good starting point for data standardization and integration is to conduct a needs analysis. This can involve a systematic review of analysis requirements, identification of data sources that need to be integrated for this analysis, and finally, identification and prioritization of data integration issues. A variation on the third case above is use of different coding systems for a given attribute. For example, there may be different systems for locating an asset or activity along a road (e.g., construction stationing versus intersection-offset versus milepost). Data standards are especially important to define for spatial and temporal referencing. These two dimensions provide the foundation for looking at patterns and relationships across data sets (e.g., truck traffic and pavement condition, weather and crashes, etc.) Where standards or “master” sources of values for these items exist, the needs assessment can determine which data sets are in compliance with these standards. Where standards do not exist, current variations in classifications and referencing methods can be reviewed to provide input into possible establishment of standards. In some cases, crosswalks or mappings can be established across different coding or classification systems. For example, in many states, a county identifier can be used to derive the district or region. The table lists commonly used data references that, when used inconsistently across data sets, can impact the agency’s capabilities as described in the second column. Based on the needs assessment, a prioritized data integration plan can be established – considering both what types of integration will have the most impact, and which are easiest to tackle. Adoption of agency data standards – these may be national standards (e.g., the Model Inventory of Road Elements or MIRE) or agency-specific standards. Standards provide a common reference for defining data entities and their attributes. As noted above, standards for location referencing are important to include. Formal designation of the single authoritative “source system” for each type of data to be integrated. Developing and maintaining a high level agency-wide data model that shows integration points between major types of data entities. Creation of boilerplate requirements language to ensure that new applications adhere to the agency’s data standards. Centralized management of common code lists – with processes to keep these in sync across disparate applications. Data and application modification – to make existing databases and supporting applications conform to standards. These modifications may be relatively straightforward or more complex, depending on the nature of the application. Data conversion or mapping services – development of standard conversion routines (e.g., to assign a district given a county, assign a timestamped event to a fiscal year or convert a linear reference to an X,Y coordinate). Creation or expansion of data warehouses that use Extract-Transform-Load functions to pull data from multiple sources and perform necessary conversions to get data in a standardized form. Development of reports that pull data from different sources and perform necessary linkages and conversions on demand. A change management strategy that includes processes to ensure that when data structures are modified in source systems, dependent systems and reports don’t break. Metadata repository tools can be helpful here – as they can maintain information about which attributes are included in different data tables. An advantage of developing a data integration plan is to identify common integration needs that can be addressed through standardized solutions – rather than as a series of independent projects to meet needs as they arise. This may require up-front effort but will save time in the long run and will lead to greater consistency and a reduced data maintenance burden. 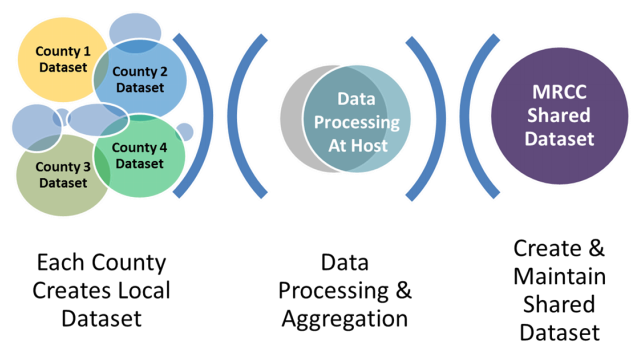 It is important to keep in mind that adopting a data standard and making sure that current (and future) data sets comply with the standard are two distinct activities. There can be both technical and organizational barriers to data standardization that should be recognized during the process of standards development and adoption. Assigning the right people with the right skill sets for supporting and enforcing standards implementation is essential to success. Both technical skills related to data architecture and organizational skills are needed. In addition, agencies should schedule a regular process of monitoring plan implementation and modification as needed based on progress made, new opportunities, and changes in priorities. The Idaho Transportation Department (ITD) now uses a commercial linear referencing system product to synchronize location information across separate systems that manage bridge, safety, and traffic data. Prior to the implementation of the commercial system, ITD had used the MilePoint and Coded Segment (MACS) LRS, a mainframe-based attribute system. Implementation of the commercial system resulted in reduced high mainframe maintenance costs, automated event location stability, and the elimination of “data integration by memo” so that changes to the LRS are automatically reflected throughout the system. To integrate the data, ITD created new data standards and data maintenance rules in order to resolve temporal issues. The new data standards and maintenance rules enabled ITD to provide capabilities to correct temporal mistakes and convert temporal events. Initial applications of the road centerline data include route-milepost and address range methods of linear referencing, and digital interaction between the road centerline data set and the hydrography data set(s). Future applications could include network connectivity solutions to support oversize vehicle routing, emergency response, and planning for intelligent transportation system deployments. Assembling a complete and useful picture of performance levels and causal factors requires a large and complex body of data. Collecting, managing and processing data to support transportation performance management requires significant expenditures – both in terms of direct data collection expense and agency staff time. In some cases, multi-agency collaboration is necessary – for example, assembling performance data for all National Highway System facilities, or for a multi-state corridor. Active planning and coordination both within agencies and across agencies is required to ensure that data collection is pursued in an efficient and coordinated fashion. This subcomponent will assist agencies in efficiently collecting useful data for transportation performance management. Identify opportunities for data collaboration. Data collaboration opportunities can be pursued to lower costs of existing data programs or to investigate ways of tapping in to additional data sources to supplement what is already collected. With respect to existing data programs, a logical starting point for identifying opportunities for data collection efficiencies is a compilation of existing initiatives and their costs. This information can help the agency to target areas with substantial costs. Consolidating data collection initiatives. For example, collection of curve and grade data for safety analysis as part of automated pavement data collection. Utilizing videologs or LiDAR imagery to extract multiple data attributes. Designating responsibilities for updating data about highway inventory and condition as an integral part of construction project closeout and maintenance management processes to reduce the need for complete re-collection of data. Establishing a data clearinghouse that facilitates sharing of data collected by multiple agencies. Maintaining an agency data catalog and requesting that staff check existing data availability prior to embarking on new data collection efforts. Establishing data sharing agreements with private sector organizations. For example, to obtain real-time travel information in exchange for information about construction schedules and reported incidents. Collaborating with regional partners to share costs of acquiring data sets of common interest. Coordinating data collection across multiple jurisdictions through a regional or statewide body that sets standards and provides support for consistent data collection and reporting, and consolidates the reported data. Once appropriate strategies are identified, work will be required to negotiate agreements. Data sharing agreements need to articulate processes, roles, responsibilities, and financial arrangements (each party’s contribution – both direct and in-kind). Negotiations will typically also involve discussions to ensure that each party’s data requirements will be addressed – considering accuracy, precision, and fit with reporting and analysis timetables. Many data sharing strategies depend on – or can be facilitated by – information technology investments. These can range from relatively simple data portals to specialized applications for data intake, processing, and display. Several examples are provided below. The MRCC is a joint collaborative project started in 2014 that involves GIS technical and managerial staff from the seven-county Minneapolis-St. Paul metropolitan area, the Metropolitan Emergency Services Board, and the Metropolitan Council. This group is facilitating the development and maintenance of an authoritative, inter-jurisdictional, publicly available road centerline data model and data set. It is doing this by having each county provide data according to specified standards (i.e., counties “control” their south and west borders and “cede” their north and east borders when edge-matching roads to boundaries). 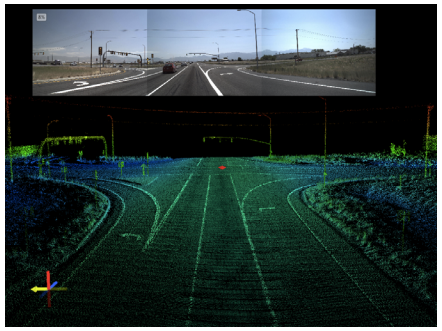 Utah DOT initiated a LiDAR data collection effort in 2011. This effort involved pooled funding across multiple departments to collect data used for asset management and related business needs. Gathering multiple types of information at the same time lowered overall data collection costs for the agency. The data included pavement condition, roadway geometrics, and roadway asset inventory. Utah DOT has created the UPlan interactive mapping platform to improve data sharing. UDOT can integrate any publicly available spatial data into UPlan. Stakeholders can also share geospatial layers with UDOT, which improves collaborative decision-making by ensuring that the agency and stakeholders can view the same information (e.g., for assessing project impacts). UDOT can change access permissions, enabling it to use and share different data sources securely. The Wisconsin Department of Transportation has developed the Wisconsin Information System for Local Roads (WISLR) to manage local road data. The internet-accessible system combines local road data with interactive mapping functionality. 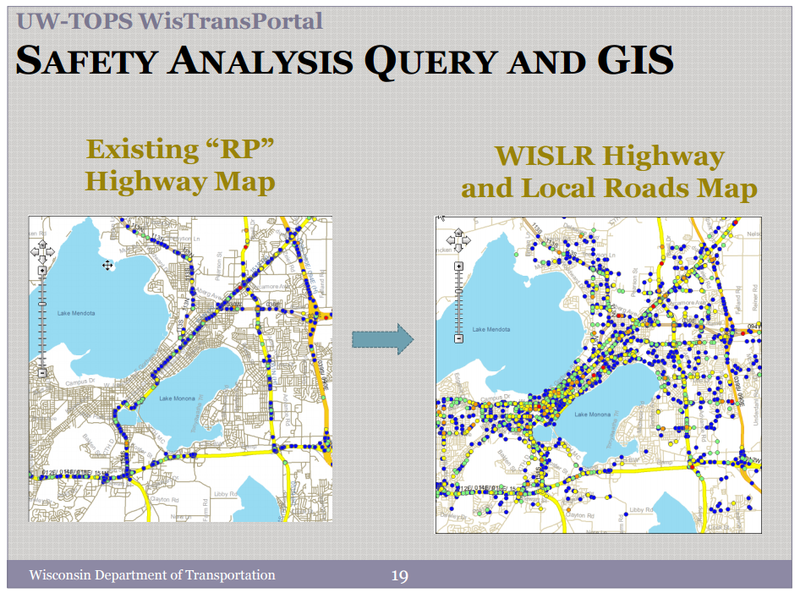 It allows local governments to report local road information (e.g., width, surface type, surface year, shoulder, curb, road category, functional classification, pavement condition ratings) to Wisconsin DOT and then use WISLR’s analytical tools, including mapping and tabulations. Local governments can update and edit their data. This system leads to statewide collaboration in which both the Wisconsin DOT and the local governments benefit from each other. In 2011, Florida DOT studied bottlenecks on its Strategic Intermodal System using vehicle probe data and travel time reliability measures. The private vehicle probe data combine real-time data from traditional sensors, GPS-enabled vehicles, and other factors. The GPS-enabled vehicles include trucks, taxis, buses, and passenger cars that have onboard GPS devices and a capability to transmit speed and location back to a central location anonymously. Florida DOT purchased this speed data in five-minute intervals for a one-year data period, which included 711 million records. 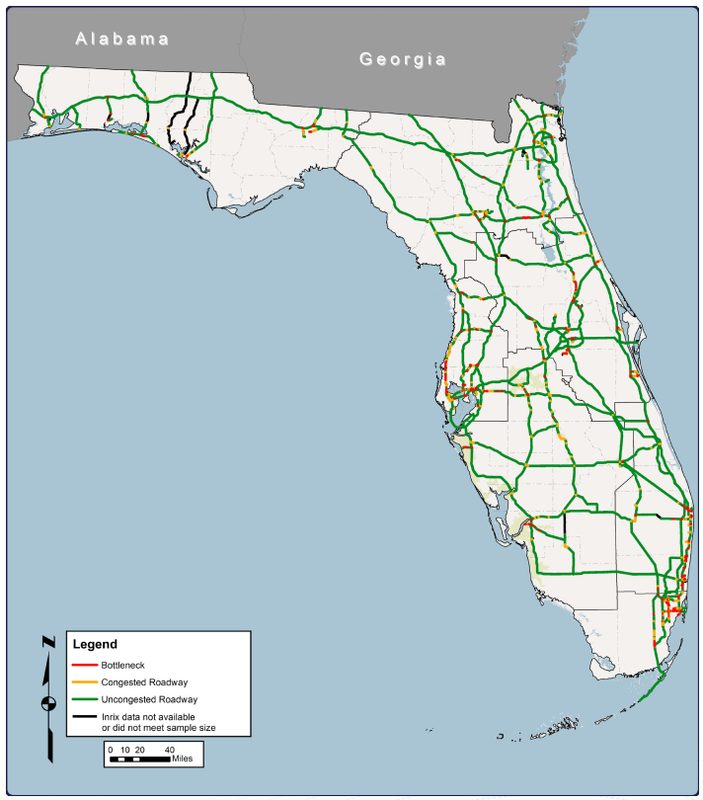 Based on these data, Florida DOT was able to calculate performance measures related to travel time and congestion, and identified bottlenecks in the state’s Strategic Intermodal System. More recently, Florida DOT negotiated a data sharing agreement with a different private navigation services provider. Under this agreement, the private provider allows FDOT access to real-time travel and incident data. In return, FDOT allows the private provider to use the agency’s data within its app. Data governance is the mechanism by which data-related decisions are made. It allows agencies to define standard data management practices and ensure that they are carried out in a consistent fashion. Strong data governance is integral to the success of initiatives to improve data quality, integration and access. Every agency already has policy and decision making structures and authorities in place. Data governance can build on these existing structures to formalize policies, roles and responsibilities related to data. This subcomponent covers key activities to consider for strengthening data governance in support of TPM. A good starting point for data governance is to document current data roles. This will provide an understanding of the current baseline situation, and will help to uncover gaps and ambiguities in responsibilities. Once current roles are understood and gaps identified, the agency can move toward standardizing and formalizing roles and making sure that accountability for these roles is established. This process will help equip the agency to proactively address its data needs. Who is responsible for defining what data should be collected/produced and how – the data elements, the frequency of collection/production, and the methods of collection/production? Who is responsible for defining data validation rules? Who is responsible for quality review and acceptance of the data? Who is responsible for answering questions about the meaning, derivation and limitations of the data? Who is responsible for creating and maintaining business metadata? Who is responsible for deciding who can access the data and approving special data requests? Who is responsible for setting up and managing the hardware and software for managing the data? Who is responsible for loading the data into a database or repository for access? Who is responsible for creating and maintaining technical metadata? Who is responsible for setting up data access environments (e.g., reporting tool configuration)? Who is responsible for fulfilling data requests? Who is responsible for data cleansing (e.g., applying data validation rules)? Who is responsible for backing up the data? From the perspective of data governance, it is useful to distinguish points of accountability for each function; it is not necessary to exhaustively identify each individual who is involved. While not all of these questions will be applicable to each data set, they can be used to identify business units and positions within these units who currently play stewardship and custodial roles for data. Typically the custodians will be located in an information technology or data management unit – but not always. In many cases, the same individual will serve as both a data steward and a data custodian. Documentation and formalization of data roles will identify key points of contact for each data set. It is also likely to lead to productive discussions about formalizing accountability in areas that are currently not well defined. Roles and responsibilities should be documented, and ideally built into employee position descriptions so that the responsibilities are clear, defined, and viewed as an integral component of an employee’s job. It is important to note that defining data management responsibilities and designating staff to be accountable for these responsibilities is a necessary but not sufficient step. Staff assigned to various data roles must have sufficient time, training, and authority to carry out their responsibilities. As part of its efforts to strengthen data governance, Minnesota DOT established data stewardship roles and responsibilities in a variety of data domains. Within these domains, Minnesota DOT has identified 120 subject area stewards. These stewards meet monthly along with a representative from the statewide Information Technology group. Identifying data sharing opportunities within and external to the department and developing service level agreements to establish expectations. Step C.5.1 emphasized a “bottom-up” approach, i.e., documenting and formalizing data stewardship and management roles at the level of individual data sets. In order to make sure that the agency is equipped to make new data investments and improvements that are cross-cutting in nature, a “top down” agency-wide structure for data governance can be helpful. An agency-wide structure will typically involve a high level strategic group with representation of different divisions (both business and IT) to set policy and make key investment decisions. It will also involve a more tactical team responsible for policy execution, data strategy and solution development and coordination. For the strategic level, agencies can choose to establish a new data governance council or it can piggyback on already existing leadership teams. Similarly, an agency may already have a data management unit that can provide tactical support – or a new data governance team can be designated. Data policies provide the basis for moving from an ad-hoc approach to data management to a more consistent and repeatable approach. For example, if the agency wants data to be integrated based on spatial location, policies need to be established that require business units that collect data to adhere to location referencing standards. Policies can be defined and rolled out incrementally, based on where the biggest issues are that impede data quality, integration, and access. Overcoming these barriers will require initial and ongoing steps to ensure management buy-in (at multiple levels), development of support documents, such as “how to” guides, allocation of staff time to meet with and support individuals who are impacted by the policy, and (in some instances) implementation of new tools. A periodic review of policies and their implementation will be helpful for identifying ways to address lingering issues. The Colorado DOT established a Knowledge Management Governance Oversight Committee, whose vision was to implement policies, procedures, and standards to be used to manage information, data and content within Colorado DOT. Developing a process for change management and training to support the data governance initiatives. Define requirements for a knowledge catalog development for the agency. FHWA is in the process of developing a plan for agency-wide data governance. The first volume is complete, providing a “Data Governance Primer.” Additional volumes of the FHWA data governance plan, when complete, will address enterprise architecture, data analytics and storage, master reference data, and open data. 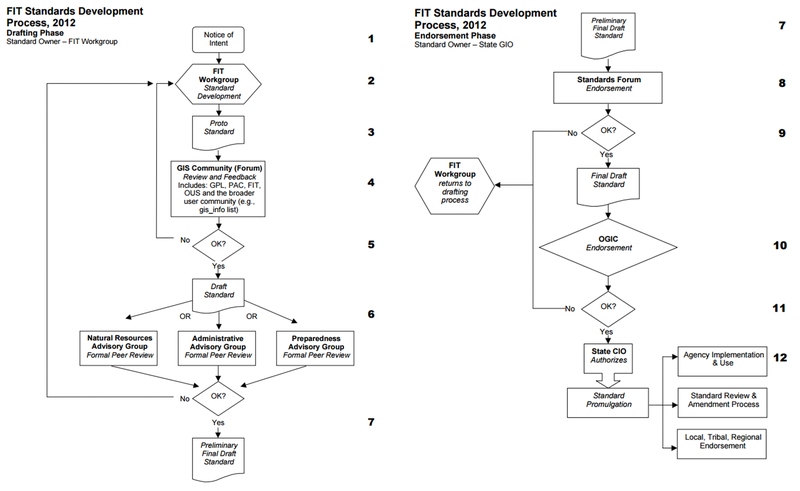 The plan currently provides a hierarchical framework for data policies, standards, and procedures. The policies are high-level outcomes consistent with strategic goals and objectives (e.g., “FHWA data are an enterprise asset”). The data standards provide additional detail on policy implementation and can cut across multiple policies (e.g., “Data Definition Conformity: Data Definitions must be established and specified between mapping entities and variables”). Finally, the data procedures provide further detail on applying data rules. 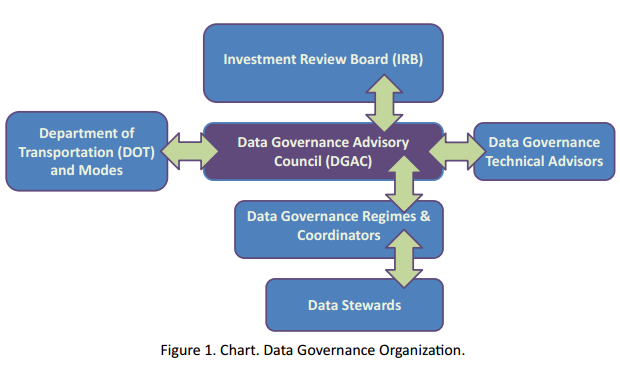 The FHWA data governance efforts have a three-tier hierarchy consisting of the Data Governance Advisory Council, Data Governance Regimes and Coordinators, and Data Stewards.